Everything was great. Maybe it would be a good thing to have a 24-hour reception. Some of the guests were REALLY loud in the night, and it would be a good thing if there was a reception and someone who can calm "the loud ones" down a little. A nice clean comfortable pension that is situated not far from the centre of the city , it is close to public transport and i thought was good value for money . I think that criticism should only be levelled if there were genuine failings either in the description of the property or facilities ect . I was happy overall. Great location for access to public transport and getting around the city. Clean and tidy but we were on the 4th floor and with no lift, it was hard work going up and down! I liked the pension very much. 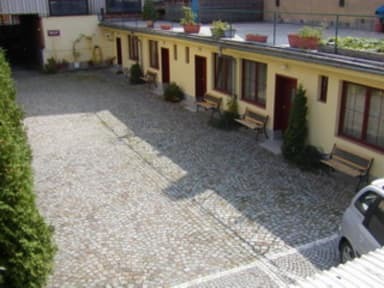 Friendly staff, very close to the main train station - walking distance 10 min and to central Prague about 15-20 min. The pension is in a very quite street, Zizkov area, just to mention it is a bit uphill walking :). Otherwise I will deffo stay here again. The only thing I didn´ t like was the shower fixed in the wall, not with the flexible hose which I prefer. Also - TAKE TOWELS with you. Otherwise all fine. The staff was AMAZING. They were all very friendly and happy to help. If I could give them 6 stars out of 5, I would. The other guests were a little loud though, which was not ideal for a light sleeper such as myself. The thin walls did not really help in that area. The hostel was clean and everything was simple and well-kept. The only hang-up was that of the three showers for our corridor, only one worked well. The staff was helpful, the location not too bad. It was quite, which was what we were looking for. However, did wake up with bed bugs; which put a bad taste in my mouth, but otherwise not too much bad to say. Some issues with other guests smoking on the premises, but overall a decent place to stay if you are in need of private accommodation in the zizkov area. Cleanliness is over al ok, but not spotless. Breakfast is basic but on par with the price range. Good laundry service, overall helpful and accommodating staff. Might stay again if travelling in a group.